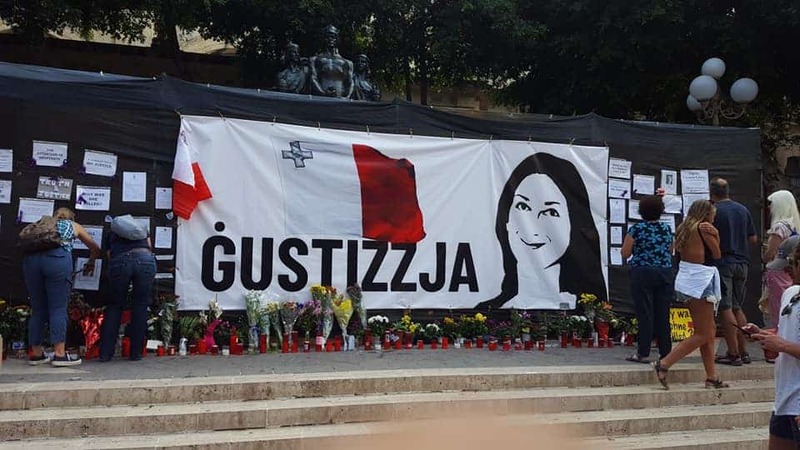 This document which you see before you certifies by the hand of a police officer that the government, using its employees, ripped away a protest banner bearing an image of the flag of Malta, an image of assassinated journalist Daphne Caruana Galizia and the word ‘Ġustizzja’ written in bold type. They also dragged away flowers and candles leaving behind them an unsightly mess of detritus they left behind in their shabby work. In the process of ripping the banner away they damaged it. These are no metaphors any more. There are no exaggerations for effect. This is state action to censor a protest. The claim of possible damage to the Great Siege Memorial, spurious as that would be, no longer applies as the banner and the candles and flowers were placed against hoarding of no material value. The claim of possible health and safety considerations given the restorations works, spurious as that would be, is not relevant as the works have not started. The claim that it is the job of public cleansing employees to clean up, spurious as that would be, does not apply because though they did the ripping and the lifting, they did no sweeping or cleaning. 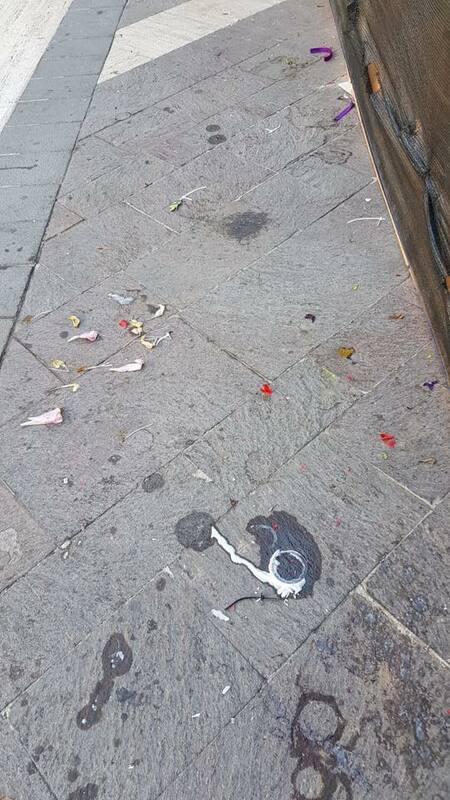 They actually made a mess and left it there. The police handed the stolen material over to us for the second time. They are getting a bit annoyed about having to be “in the middle of the charade”. They confirm to us they see nothing illegal in our actions. And that is further confirmed by the fact that if there was an illegality the stuff would be kept as evidence in some sort of prosecution not returned to us on the spot. 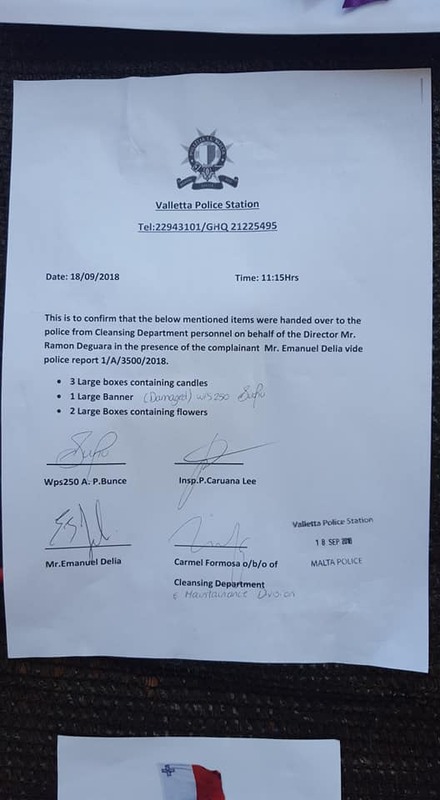 They are unwilling to prevent the government employees from acting in this way because, the police told us today, the public cleansing department says it is acting on the personal instructions of Justice and Culture Minister Owen Bonnici. It’s not beyond their power to stop illegalities perpetrated by Ministers and their staff. But we know where the Malta Police stand on enforcing laws broken by Ministers. Activists gathered at 11 am on a Monday morning, leaving their desks, their businesses and their offices, to hang the protest banner back and to replace the destroyed flowers and candles. As soon as we all went back to work a lady showed up and wanting to make a point, though it is not entirely clear what her point is, picked up what she could carry from the protest site and took it to the police station. She ripped off messages of protest from the hoarding too and tried to rip out the banner but that was too big even for her steely determination. Pictures of her doing this are making the rounds. I have seen them of course. But not putting them up here. She is not the point. Of course, it saddens me that someone seems to be protesting against the right to protest which is as logically perverse as anything you can think of. But in her mind, she was convinced she was doing the right thing. After all, everyone has the right to be wrong. It does sadden me to be confronted by pebbles too hard for the water of truth to penetrate anywhere beyond the surface. But I understand too that if persuading people who would rather hate you than listen to you was easy, we wouldn’t need to do this. I’m also reminded that just last week actions practically identical to hers at a “makeshift memorial” as the adopted term now appears to be in Northern Ireland where people leave flowers to protest the killing of British soldiers by the IRA in 1979, are being considered as a hate crime by the British police. But I have no desire to see this lone woman prosecuted. Not when the government itself — the people trusted to run our own state on our behalf with the overriding responsibility to protect our rights and freedoms — has committed this with impunity repeatedly. I feel sad for what she did, but I only feel anger for the government that hides behind a woman like this or behind government employees they send to do their illegal acts on their behalf hard at night. I feel anger at Owen Bonnici, the coward who campaigned against censorship 10 years ago when that fit his political narrative and now perpetrates it as an official act. But like the woman who covered for him today and volunteered to give him an alibi because that will go down well at the next kofimornink tal-partit, Owen Bonnici too is covering for the real cowards. This censorship is perpetrated by Keith Schembri, Konrad Mizzi and Joseph Muscat, fugitives from the law who pervert the course of justice to cover up their crimes. For them any semblance of justice in this country is not merely a political inconvenience: it is a real and present danger to their reputations, to their wealth, to their personal business interests, and to their liberty to go on with impunity. A woman lifting candles away from a protest site is a stupidly loyal disciple. But it is wrong in any war to think the problem is the little private that is shooting at you. They are as scared as you are. The bullet rushing towards your forehead is from their gun. But the trigger was pulled from behind a general’s drinks cabinet in a plush office. Joseph Muscat wants us gone.